Light mounts are vital to achieving adequate lighting conditions in industrial facilities. They can support optimal positions for fixtures during operation, which may prevent light wastage and improve visibility in confined spaces, as well as rooms with complex machinery. This article expounds on the three most common types of industrial light mounts for hazardous locations: surface, ceiling and pendant mounts. Surface mounts are installed directly on the surface of the foundation, which can be horizontal or vertical. Walls and panels are examples of common foundations for surface mounts. Surface mounted luminaries do not have a canopy or stem, and the lights cannot be independently aimed in a specific direction. However, this does not mean that the lights are not effective. Since the fixtures are closer to eye level, the target area is adequately lit up. For explosion proof systems, it is common for a junction box to house the electrical components of the fixture separately, away from the bulb. The box may either be concealed or housed within close proximity to the light, usually at the base of the fixture. During installation, the wires are fed from the junction box, to the light via an electrical conduit or pipe. To avoid ignition of flammable gases, vapors or dust, individuals should observe the National Electric Code on best practices for wiring in hazardous locations. Surface mounts perform well when installed against walls of square or oblong-shaped facilities. 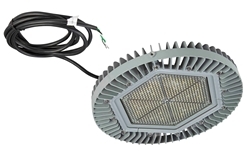 Installation must be carefully planned when working with numerous surface mount lights to prevent reflection. For rooms with ceilings higher than 2.8 meters, the fixtures may provide optimal irradiation at volumes above safe eye levels (six feet or 1.8 meters above floor level). As the name suggests, ceiling mounts are applicable for lights that are installed on the ceiling of a facility. This mounting type is ideal for general lighting and locations with low ceilings, because it throws light over a wide area. During application, illumination comes directly from the top of room, and offers a 360° irradiation radius. Ceiling mounts may present problems when installed in small rooms. In such settings, lights may reflect from the walls and cause inconsistent lighting conditions. To prevent this from happening, units with horizontal irradiation beams should be applied. Prior to installation, the load bearing capacity of the ceiling or roof foundation should be thoroughly checked to accommodate the mount, especially for facilities that require several ceiling-mounted fixtures. By comparison, ceiling mounts are heavy, and are usually double the weight of wall or corner mount units. For hazardous locations, installing a ceiling mount is a straightforward process. Traditionally, the actual mount piece is installed on the support surface, covering the electrical conduit. Unlike a surface mount, the main housing of the fixture is connected to the mount. In marine applications, all wiring, including supply wire, must be stranded wire, and meet guidelines set forth by the United States Coast Guard (CFR46) sections (110-113). In hazardous locations, pendant mounts are useful for lighting systems that require an explosion proof light to be installed away from the surface of the ceiling. Facilities that need task and general lighting solutions may benefit from this type of mount. Because the light is closer to the target area, workers may experience better lighting conditions in the installed location. “Pendant lights make for attractive focal points in any space while doubling as a lighting source. Also, a pendant can be a space-saving alternative to a floor lamp or table lamp because they can provide ambient lighting over a greater surface area,” explained Dickson Wong from Huffington Post. During installation in hazardous locations, a junction box houses the fixture’s electrical components (away from the other end of the connection, like surface mounts). For example, a unit may feature a ½” NPT junction box at one end, and a ½” NPT adjustable L-bracket on the other end. Wiring is fed through the rigid pipe, connecting both ends of the fixture.